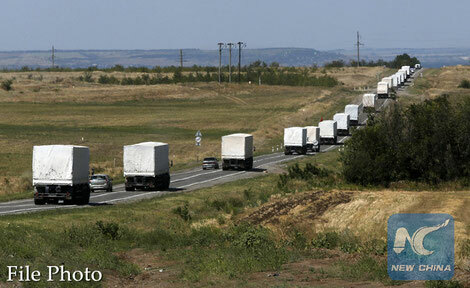 A Russian convoy of trucks carrying humanitarian aid for Ukraine drives along a road in the direction of the border with Ukraine, after leaving Kamensk-Shakhtinsky, Rostov Region. KIEV, Dec. 22 (Xinhua) -- The infrastructure modernization in Ukraine will enhance the country's role in building the modern Silk Road, Ukrainian Prime Minister Volodymyr Groysman said here on Friday. "Modernization of the infrastructure will strengthen Ukraine's position as a key country at the New Silk Road," Groysman said at his annual press conference, according to the government's press service. Ukraine cooperates with China and other countries on the joint development of the Belt and Road Initiative, Groysman said, adding that the modernization of road, railway and port infrastructure paves the way for Ukraine to become a Silk Road logistic hub. China and Ukraine signed an action plan on jointly building the Silk Road Economic Belt and the 21st-Century Maritime Silk Road earlier this month during the Intergovernmental Commission on bilateral cooperation in Kiev. This year, the Ukrainian government started a major modernization of the country's infrastructure, prioritizing projects on automobile roads, seaports and airports upgrade. Next year, the Ukrainian government plans to focus on the modernization of rail network, the prime minister said.